Are you tired of hearing your kids saying “are we there yet” during family vacations? Whether they’re your own or someone else’s, factoring a child’s needs into your travel involves a lot more than sticking on a playlist and making regular toilet stops. All parents understand that bored and overtired children can become cranky and frustrated. Avoid this by using our unique multipurpose activity tray which can help improve your driving experience by offering a flat packed, safe area for your little ones to eat and play. 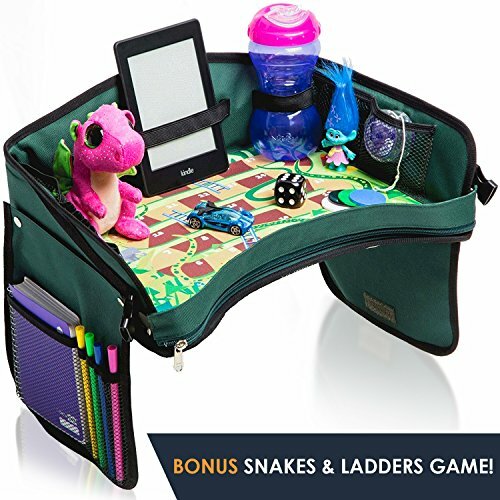 This entertainment tray is perfect for your child when playing with toys, eating a snack, coloring in books, watching one of their favorite TV shows on the iPad, or playing a fun game of snakes and ladders. It can also be fully detached and easily reassembled. Fitting most booster seats, this Lap Tray can be taken everywhere your little ones might need entertaining. Crafted from premium quality ultra-durable, 600 denier polyester fabric this carseat tray table also features pliable and soft foam reinforcements that fold on impact – ideal for optimum safety! The two-inch front walls stop food, drinks or toys falling off on the move, saving you precious time cleaning up spilt juice stains or crumbs from the seats or floor. Our convenient and safe to use Play Tray is easy to clean and 100% washable – sticky finger prints are a thing of the past! KEEP KIDS ENTERTAINED. ANYWHERE. ANYTIME – Capture your child’s interest for hours with our mobile car seat travel tray. Ideal for use whilst traveling in a stroller, car, airplane or train. Can also be used at home, in a restaurant, or at preschool. BONUS SNAKES AND LADDERS BOARD GAME – Includes safari themed game, counters and dice. All products have been created with your child’s safety in mind with oversized game accessories. Our snakes and ladders board game has been printed on the bottom of each travel tray to produce a multifunctional product. Create memories and quality family time on the go! VERSATILE SNACK AND ACTIVITY ZONES – Our premium travel organizer tray incorporates; stretchable mesh pockets, elastic drink bottle holders, flexible straps for technology / tablets, and multiple storage areas for pens, crayons, books, coloring books, pacifiers, and toys. DURABLE AND EASY TO CLEAN SURFACES – Made with 600 denier polyester, our car seat tray features a robust base, sturdy side walls, industrial grade zips, high quality stitching, and straps that can be adapted to clip around the back of any booster seat. The walls and pockets are designed to easily be detached for cleaning. Our car tray can be flat packed – simply unzip all walls and unclip straps for effortless storage. PERFECT GIFT IDEA – Perfect gift idea for babies, infants, toddlers, nieces, nephews and friends to celebrate the holidays, birthdays, or baby showers. Plus a 30 DAY MONEY BACK GUARANTEE, just in case you’re not satisfied with your purchase.